In addition to genetic mutations responsible for particular physical traits, like other purebred dogs, Chinese cresteds are known to inherit some genetic mutations responsible for causing inherited disease. Inherited diseases of the eyes are of particular concern to Chinese crested breeders as indicated by the optional recommendations listed on the Canine Health Information Center (CHIC) website to test for the diseases known as progressive retinal atrophy, progressive rod-cone degeneration and primary lens luxation in the breed. Rather than a single disease, PRA is a group of inherited eye diseases caused by a variety of different genetic mutations in multiple genes. These mutations result in vision deficits often progressing to complete blindness. Regardless of the specific mutation involved, PRA is characterized by the degeneration of special photoreceptor cells of the retina known as rods and cones. Two genetic mutations associated with PRA have been reported in Chinese cresteds. In addition to progressive retinal atrophy, progressive rod-cone degeneration which is listed on the CHIC website, Chinese cresteds have also been reported to inherit the disease known as progressive retinal atrophy, rod-cone dysplasia 3. PRA-prcd is a late-onset form of PRA caused by a genetic mutation in the PRCD gene. Dogs affected with PRA-prcd typically do not present with clinical signs of vision loss until at least 3 to 5 years of age. Night blindness and loss of peripheral vision are the most common presenting clinical signs with loss of vision in daylight to follow. Though there is individual and breed variation in regards to the age of onset and rate of disease progression, most affected dogs will become fully blind as they age. The late age of onset associated with PRA-prcd can cause significant issues for breeders relying on veterinary eye exams alone to diagnose eye disease. This is because many affected dogs will not show signs of PRA-prcd on eye exam until after they have reached breeding age. Without genetic testing of dams and sires, breeders may unknowingly breed dogs that are at-risk of having PRA-prcd affected puppies. Though also a cause of blindness, unlike PRA-prcd, PRA-rcd3 is an early-onset form of PRA affecting Chinese cresteds due to a mutation in the PDE6A gene. Dogs affected with PRA-rcd3 can be identified on veterinary eye exam as early as 6 to 16 weeks of age with disease associated changes to the retina, prior to showing clinical signs of blindness. Though presenting with similar clinical signs as PRA-prcd, dogs affected with PRA-rcd3 are often completely blind by one year of age. However, some dogs may retain limited sight until they are two or three years old. Both of the progressive retinal atrophies identified in Chinese cresteds are inherited in a recessive fashion meaning that dogs must inherit two copies of the specific disease-associated mutation (one from each parent) in order to develop disease. Dogs only inheriting a single copy of a mutation are considered carriers and will not show clinical signs of the disease themselves. However, carrier dogs can have affected puppies if bred with another carrier of the same mutation. Therefore, testing of both parents prior to breeding is crucial. In order to prevent producing affected puppies, dogs carrying one copy of either PRA mutation should be bred to dogs free of the same mutation (“clear” dogs). Though no affected dogs would be produced from this pairing, it should be noted that approximately 50% of the puppies will be born as carriers. 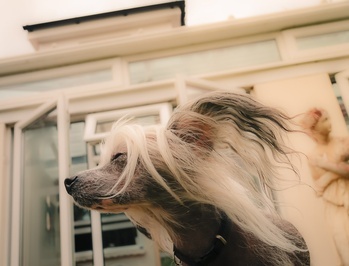 Primary lens luxation caused by a mutation in the ADAMTS17 gene is an inherited eye disease identified in numerous breeds including the Chinese crested. Affected dogs are prone to dislocation of the lens in the eye due to breakage of ligaments responsible for holding the lens in place. Dislocation of the lens in the forward direction is most common and more serious than in the reverse direction due a risk of secondary glaucoma and the related potential for damage to the optic nerve. Lenses dislocating in the forward direction should be addressed immediately in order to protect vision. In either case, surgery to remove the dislocated lens and replacement with an artificial one is the only option to restore full vision. However, lenses dislocating in the reverse direction do not tend to cause problems and are often only monitored for complication due to increased surgical risks and the demanding technical ability required for removal of a lens from the rear portion of the eye. Dogs undergoing lens removal without replacement still retain vision, but are unable to focus on objects near to them. Since the mutation is responsible for affecting both eyes equally, it is not uncommon for a dog previously treated for lens dislocation to develop a dislocation of the opposite lens at a later date. This very scenario occurred just two weeks apart in a rat terrier named Rickie Roo, who aside from being the canine reporter for the United States Dog Agility Association has also become a great friend to Paw Print Genetics. Though dogs inheriting two copies of the ADAMTS17 mutation (one from each parent) are most likely to develop lens dislocation, dogs inheriting a single copy also have a lower, but increased risk of disease. Therefore, breeders attempting to eliminate ALL risk associated with this mutation, would be advised to only breed dogs that have not inherited a copy from their parents. If you have questions how the mutations described above could impact your breeding program or have general genetic disease questions. Please contact the Paw Print Genetics laboratory at AskUs@pawprintgenetics.com or give us a call at 509-483-5950.